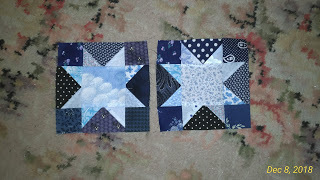 Home » blocks » 2 Scrappy Dec Stars for Kathy S.
2 Scrappy Dec Stars for Kathy S.
Posted by Kathy.Snider on December 8, 2018 in blocks | Comments Off on 2 Scrappy Dec Stars for Kathy S.
Here’s the first two Scrappy Dec Stars that I’ve made. I cut enough for nine, so hopefully there will be more to come soon. Happy December!